Check out Hyphen's original infographic spreads here: Population Data, Languages, Education, Internet, Income, Health, Veterans, Voting, Businesses, Poverty, Future. America's oldest mandates, remains a vital benchmark of growth and change. Americans as an economically successful and highly educated population. traditionally undercounted by the census? lump the populations together with East Asian and Southeast Asian data. and highlighted individuals whose stories mirror the national trends of today. 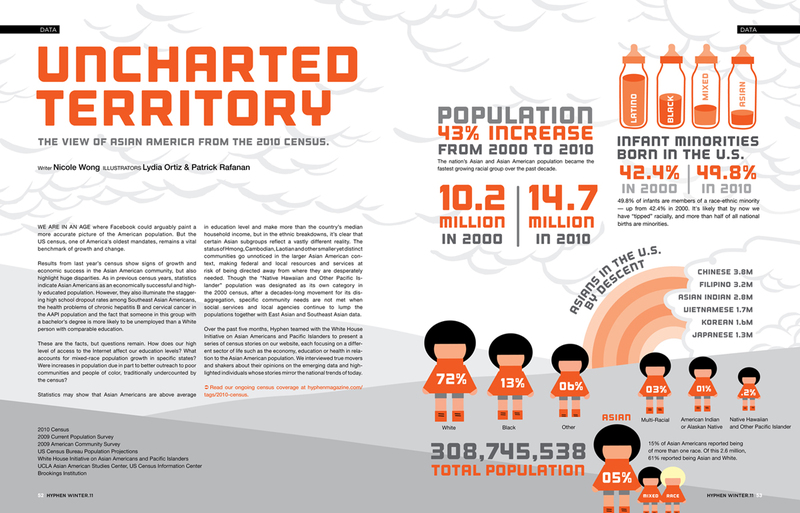 Read our ongoing census coverage here, and check out Hyphen's original infographic spreads about the 2010 Census.